Friday, February 12, 6:30 p.m.
Carlos Medina , Neutrinos AGM, 2016. Spatial Interventions. Acrylic and nylon. Variable dimensions. “The natural evolution of sculpture is oriented towards the immaterial.” Under this premise, the Venezuelan artist Carlos Medina presents Essential, an innovative proposal in the spaces of Ascaso Gallery, located in Wynwood, Miami’s art district. Next Friday February 12 from 6:30 pm the American public will be able to enjoy an individual show displaying the recent work of this consecrated sculptor of abstract-geometric orientation which will certainly impact the whole attendance. A total of twenty-two pieces, including assemblies, surfaces and spatial interventions will occupy the walls of Miami’s multifaceted exposition space for two months, under the curator ship of architect Mauricio Alfonzo. 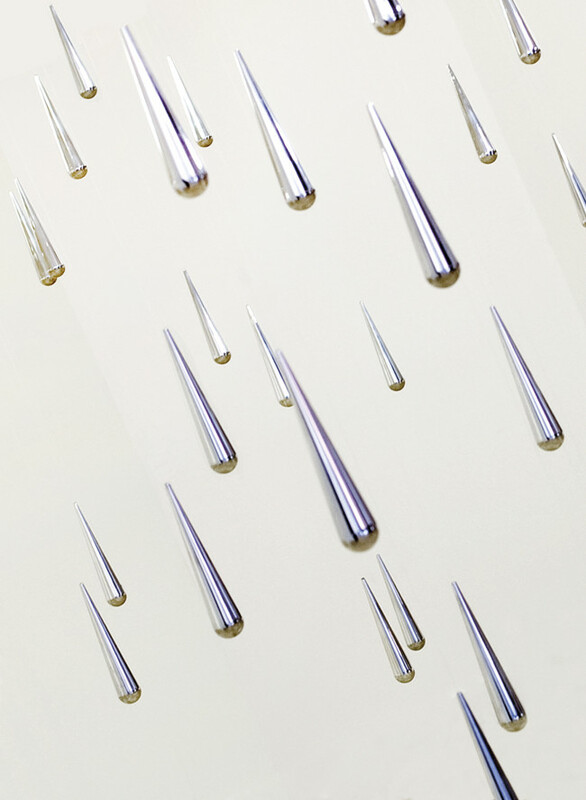 Carlos Medina, Fragmento de lluvia AGM, (detail), 2016, Spatial intervention, Aluminum and nylon, Variable dimensions. Carol Damian, an outstanding art researcher and professor at Florida International University, states in the catalog issued on the occasion that “There has long been the Minimalist conviction that purist, abstract painting “wanted” to become sculpture and move off the walls, and Medina has followed this trajectory throughout a career that constantly explores the formal aspects of art production, never afraid to make changes and move beyond the expected. Among his latest experiments, there are “ensembles” that use layers of canvas, plastic and aluminum in remarkable ways, defying a sense of solidity as they literally “curl” off their backgrounds, and playing with the stability thought to be intrinsic in two-dimensional works. He is constantly using a variety of materials and expressive methods to carry his experiments with plane and surface to create new spatial constructs and interactions." 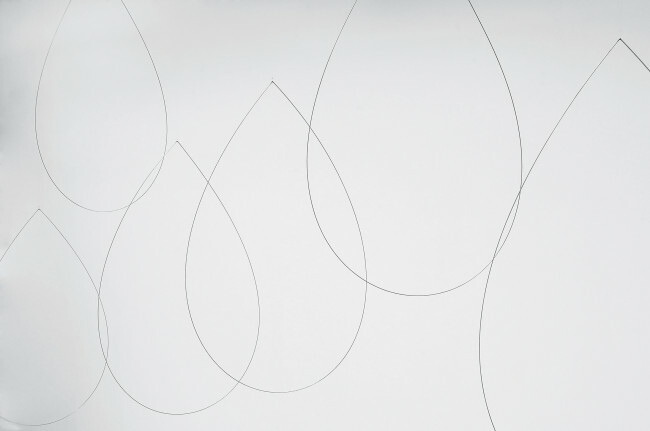 Carlos Medina, Gotas, (detail), 2016, Spatial intervention, Steel rod and nylon, Variable dimensions. With a quarter century history in Caracas and Valencia, Ascaso Gallery opened its doors in Miami to extend its rich exhibition program and offer professional specialized art consulting services to South Floridians and other US clients. The gallery’s impeccable status in the international fine art community is backed by experience, expertise, expanding market and its selection of the leading names of Venezuelan and Latin American masters. Antonio and Limari Ramirez de Ascaso have given their support to public art projects and publication of serious catalogues and books making a priority to contribute scholarly thinking and writing on Latin American art history. Ascaso Gallery is a constant presence in the most prestigious art fairs worldwide. Art Circuits' Announcements is a news distribution service oriented to art professionals, media and collectors. Our database reaches a targeted audience of over 15,000 art minded online subscribers throughout Latin America, United States and Europe, including 2,000 writers and art critics in The Americas.The e-mail announcements include an active URL which links directly to each client’s site and they are echoed in facebook, twitter & Instagram. Art Circuits was founded in 2003. To send a tailor-made announcement or to advertise in our newsletters advertise@artcircuits.com or 305 661 05 11. © 2015 Art Circuits Map & Guide. All Rights Reserved.